J has wanted to go to Audrey Claire for a long time. He’d actually been talking about it since last summer. For whatever reason, it just never happened. When we got together with P and E for dinner on Saturday, I suggested it as a nice and local option. They agreed! Off we went. We ate super early, so it wasn’t too tough getting a table. 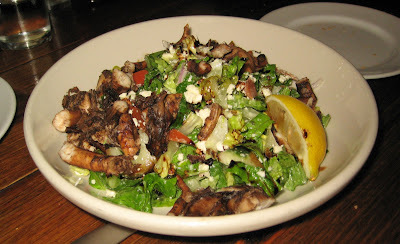 The grilled octopus salad. I’ve gotten this a few times here before, and I love it. 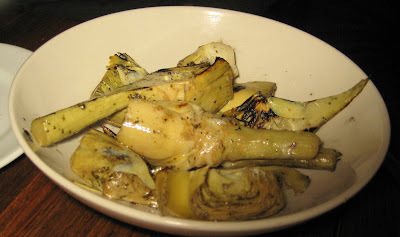 Grilled artichokes. Now I’m not into artichokes at all, but they all started raving about it, so I had to at least taste it. I liked it! It had a lovely grilled flavor, and so the sourness of the artichokes was diminished quite a bit, and was probably why I ended up liking it. If all artichokes tasted like this, I could start eating them regularly. 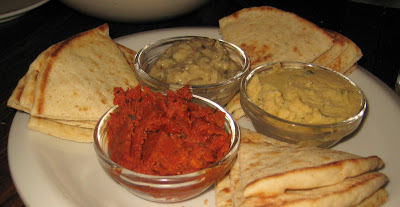 The mediterranean spread with hummus, roasted eggplant and fontina, and sun-dried tomato and garlic spreads. The hummus? Good, but the least exciting of the 3. The sun-dried tomato and garlic spread was delicious. Strong tomato flavor, garlicky, slightly spicy. But the best of the lot, by far, was the eggplant spread. Oh my word, so damn good. I could have just eaten this with a spoon. E got the pork chops as her entree. 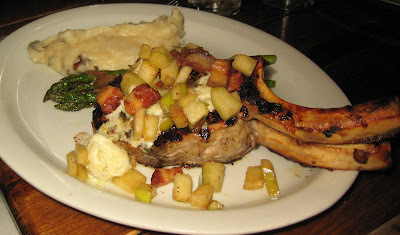 A giant chop with grilled apples, served with asparagus and mashed potatoes. She liked it, and she couldn’t finish it. Lightweight. 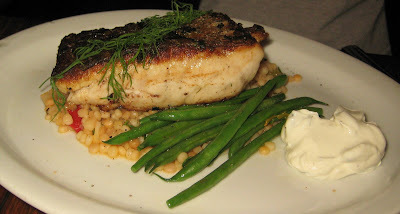 J got the special, which was barramundi, or a type of australian seabass. A giant heaping portion of this fish, cooked well, and quite delicious. This was served on top of israeli couscous along with some haricots vert and a cucumber sauce. Oh man, I traded my asparagus for these green beans, and they were delish. P and I both got the other special, which was a hanger steak. 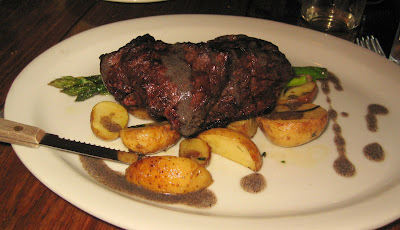 It was also quite a large piece of meat, served with oven roasted potatoes and asparagus. We both enjoyed our meals. It’s a byob, so be sure to bring your booze along. Everything is cooked to order, so don’t expect your food to come out very quickly. You can see the open kitchen in the back, and it’s tiny, so just give it some time. Service was good, nothing great. Even when the place started filling up and there were people waiting for tables, we just sat around for awhile and they didn’t rush us out, which we appreciated. E couldn’t help noticing some nearby diners who were clearly on a horribly uncomfortable first date. It makes me cringe just thinking about it now. We all came to the superficial conclusion that the dude was definitely the better catch of the two, and that he should go do better. Girl, could you crack a smile or two? No. So sad. We really wanted to go over there and fill their glasses with booze, to ease the tension. One more note… after dinner, we took a little walk to Black Sheep on this pre-St. Patty’s day weekend. It was crazy because there were leftover drunk erin express people there, along with some barely dressed guinness chicks getting people to sign a petition. P & E introduced me to the Dirty Hoe, which is a hoegaarden with some framboise poured in. Now I like hoegaarden tons on its own, and I’m a fan of lambic as well. Framboise is a bit too sweet for me, but you know I love me some peche lambic. Well, when you put the framboise and the hoegaarden together, what you’ve got there is now my favorite beer drink in the world. Delicious.